The following story appears in the fifth edition of "Tomahawk Talk," the official gameday publication of the Gwinnett Braves. Pick up a FREE copy at Coolray Field from August 12-September 3. Born in Snellville, GA but raised in McKinney, TX, Matt Lipka was a star on both the diamond and the gridiron at McKinney High School before being drafted by the Atlanta Braves in the supplemental first round in 2010. A two-time All-State wide receiver in football-crazed Texas, Lipka turned down an offer to play at the University of Alabama for a chance to join the Braves. Major injuries to his hamstring and his left hand slowed his minor league development, but after a healthy return with Double-A Mississippi in 2015, he has earned his first promotion to Triple-A Gwinnett in 2016. Dave Lezotte of Tomahawk Talk caught up with Lipka to talk about his choice to play baseball, his athletic family, his perseverance through injuries, learning a new swing and more. Dave Lezotte: You were born in Georgia but moved to Texas at a young age, did you grow up watching the Braves? Matt Lipka: Oh yeah. I watched them when I was growing up, I think it was on TBS, they were on every night. Obviously Chipper Jones was there, that was my boy. I watched him and had a lot of Chipper shirts and stuff. DL: The Braves drafted you in the first round in 2010, how did you and your family react? ML: It was almost like a dream. I had family here in Georgia, my brother was living in Acworth, my sister was in Decatur. It brought us a lot closer to them, because we were in Texas and hadn't been back to Georgia in a while. So (the Draft) happened, and three days later we're getting the call and I'm going to Orlando to play. It was just a whirlwind of emotions. Draft day, it was by far probably the best day of our lives. DL: You signed with the Braves despite having a chance to play college football at Alabama. Was that a tough desicion? ML: It was tough at the time, coming off that season where I had a big year and was first team All-State in Texas. I was really fresh off football, so that was tough, but I think my dad did a really good job helping me realize that, for long-term longevity, baseball was going to be the decision. DL: Do you miss football? ML: I don't know, man, the game days were unreal. The practices get a little bit monotonous when there's only one game a week. I'd say the Friday nights, I definitely miss those, you can't duplicate that. I'd imagine a big league game would duplicate it times 10, but yeah, football was fun. I miss it, but I don't miss the abuse the game puts on your body, for sure. DL: Your quarterback at McKinney High was Seattle Mariners' minor league pitcher Zach Lee, who was also drafted in the first round in 2010 by the Los Angeles Dodgers. Do you two stay in touch? ML: A little bit. I send him a text every once in a while, especially when we're both doing well. His mom texts me a lot, she'll send me some inspirational stuff every once in a while. Both our families are close, and he and I are close. Whenever we get back to McKinney, we always go up to the high school and throw to each other. He likes to take batting practice on the field too, he can't hit the ball very good, but he likes to take BP (laughs). DL: You come from quite an athletic family, both your older brother and sister have played college football. That's pretty unique. ML: The whole 'sister playing college football' and being a kicker, she definitely got some ESPN coverage from that. It was crazy. Inside 35 yards, she was automatic. My brother played at Georgia Southern, he was just a freak-show linebacker, a little undersized but he didn't play like it at all. It's just a super-athletic family, and I think I was the first one to really go baseball, so that was kind of different. DL: Since starting your pro career in 2010, you've battled serious injuries, including a severe hamstring tear in 2012 and a left hand contusion in 2014. How frustrating have the injuries been? ML: Super frustrating. You go through the hamstring, completely tearing it and almost having to learn to walk again. That's tough, and then the hand injury (happens). What people don't realize is that when you go down, you miss that whole year. There's no development that year. You obviously can't get those years back, especially when it comes to development in baseball. Honestly, I'd say from the adversity point of things, it has made me a lot tougher and it's really made me who I am today. DL: One major thing you've been working on over the last year is a change in your swing. What exactly have you changed, and how did you do it? ML: I used to be a foot-down-early kind of guy, just swing down. Then I saw a guy on Twitter half-way through last year, and he had worked with (Toronto Blue Jays' third baseman Josh Donaldson). It was Bobby Tewksbary. I went to go hit with him for a week down in Tampa. I learned a ton, mixed in movement and dropped the hands a little bit. There's so many intricacies that I learned. I think having knowledge about your swing is probably the most important thing throughout someone's career. DL: Last year, you played a fully healthy season at Double-A Mississippi. Did that help build your confidence back? ML: A ton. I didn't hit the (disabled list). I really learned a lot as far as preparation goes. Getting ready for every game and making sure the body's feeling right first and foremost. I learned a lot as far as everyday preparation goes and how to recover. 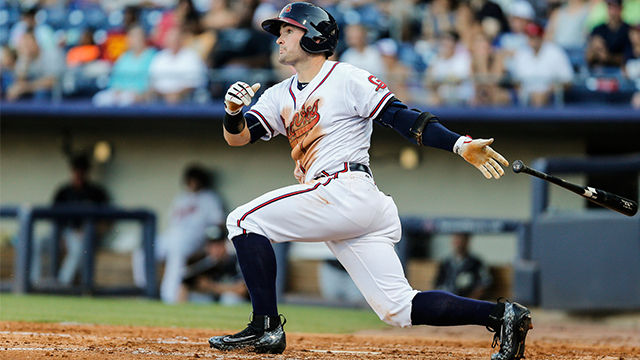 DL: After a slow start with the G-Braves, you batted .323 in 20 games in July. How have you made improvements since reaching Triple-A? ML: Actually, I honestly haven't changed anything. I've just been coming to the field, trying to stay process-oriented. No matter if I'm in the lineup or not that day, it's just getting the work in that I know I need to get in. When things weren't going well earlier, I was still hitting the ball hard. I think this last month, all you're seeing is really just balls starting to fall and getting some over the fence, that's about it. DL: Here in Gwinnett, you're on the doorstep to the Majors and joining the Atlanta Braves, your favorite team growing up. What does that feel like? ML: It makes you a little bit hungrier. You're seeing every day, guys are coming down from the big leagues or going to the big leagues. It's clear that this is one step away. You've just got to stay process-oriented, keep working and it will happen.